mica have been preferably used in water-based and oil based oil-well drillings operations as an additive mud chemical to prevent loss of circulation and seepage. Mica is specially added to seal-off the lost circulation zones. The platy structure of micafacilitates the overlapping of particles to form a layer or wall and acts as a sealent that bridges the openings. The use of this mineral helps to seal porous formations and contributes to regain circulation keeping the solids in suspension. The technique adopted is to mix quantities of mica flakes and granular bentonite into special batches of mud which is pumped down the hole. The drill pipe is then withdrawn and the hole left undisturbed for a time being. Mica flakes tends to plate out on the walls at the lost zones and reduce the size of the holes through which the mud can pass. After a short interval, the plug is strong enough to permit circulation to resume without loss. Drilling then proceeds normally until a depth well below the lost circulation zone. Coarse Mica Flakes: Suitably used for sealing openings. Apparent density = 0.17kg/ltr. Particle Size : Max 10% retained on 9.50mm B.S.Sieve. Material retained on Sieve 4.75mm + material passed through 1.70 mm = 30-40% Max.Medium Flakes : Generally used to combate mild circulation in porous formations. Apparent density=0.18 kg/ltr. Particle size: Max 10 % retained on 3.35 mm B.S.Sieve. 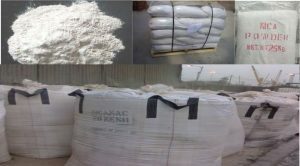 Material retained on 1.70 mm + material passed through Sieve 0.425 mm = 30-40% Max.Fine Mica Flakes : Suitable for use when a sealing agent is needed to be small enough to pass through a shaker screen without interfering with the operations. Apparent density=0.20 kg/ltr. Particle size : Nil retained on 0.850 mm B.S.Sieve. Matertial retained on Sieve 0.425 mm + material passed through sieve 0.15 mm = 30-40% Max. Plenty of water is the most satisfactory lubricant. Keep a continuous stream pouring on the work and cutting tools to keep it cool – insufficient cooling can result in chipping and rapid tool wear. Add water-soluble oil to the water to reduce tooling rust. Wheel cutting is the most satisfactory method of cutting glassmica composites. Use a bonded silicon-carbide type abrasive cut-off wheel. If available, bonded diamond wheels are preferred. Cut across the grain whenever possible. Work slowly and steadily, do not force the tools, and keep tool speed to suggested levels. Cut down into the work – never up from the bottom. Keep the speed between 2000 and 2500 rpm and advance the work by “feel”. The wheel should cut steadily without dragging. Mica is used in both water based and oil based muds either as part of a blend of lost circulation materials. Coarser grades are effective to control losses, pumped as a peel in fractured or porous formation. Fine grades pass through the shaker screen, so they can be used as a pre-treatment to control seepage losses. Mica is also used in oilwell cementing it is generally used as an additive to prevent or reduce lost circulation. Mica, have a suitable particule size distribution so as to form an adequate bridge on the fractures.